With SOLIDWORKS 2018, you can Check for solutions when SOLIDWORKS crashes, a new option available in ‘Options > System Option’. When enabled, SOLIDWORKS will make sure you never miss out on an available solution to your crash. How so? When it unexpectedly quits, SOLIDWORKS compares the type of crash with similar crashes that the SOLIDWORKS R&D team has already fixed, either in a later service pack or through a Hotfix. Your feedback and your awareness are two important factors, this is why we encourage you to take part to both SOLIDWORKS Customer Experience Improvement Program and the Check for solutions when SOLIDWORKS crashes. Last month, Brian discussed the topic of Linear Static Productivity. This month, Brian comes back to talk about Shell strategies. Next month, Omar will discuss the topic of Productivity Tools. 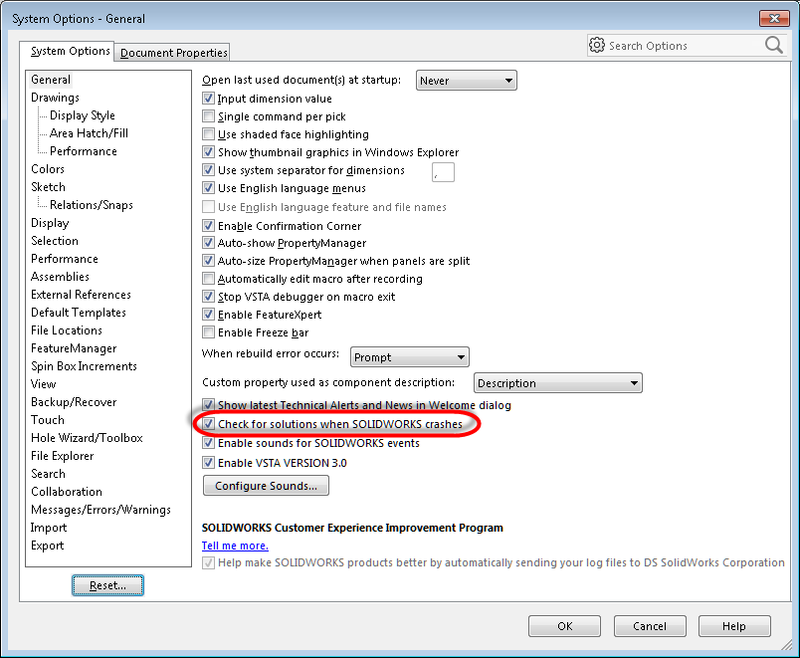 Is Microsoft® .NET Framework 4.7 compatible with SOLIDWORKS® 2017? SOLIDWORKS® 2017 is tested for compatibility with Microsoft® .NET Framework 4.5.2. Microsoft provides the .NET Framework 4.7 version as an update to version 4.5.2. It is an expectation that version 4.7 is backwards compatible with installations that require .NET Framework 4.5.2. Microsoft is responsible for backwards compatibility. When I attempt to check SOLIDWORKS® files in to a SOLIDWORKS PDM vault, why do I see an error that states ‘An invalid pointer was supplied to the method’? If you see this error message along with a client log error message similar to the following, it indicates that the ‘SWDocumentMgr’ dll’s are not registered properly on the system performing the check in. For a resolution of this problem, see Solution Id: S-073437. For SOLIDWORKS® Simulation, how do I use a SOLIDWORKS® Rx file to identify the ‘License Order’ for a SolidNetWork License (SNL) client? To identify the ‘License Order’ for a SolidNetWork License (SNL) client using a SOLIDWORKS® Rx file, follow the steps in Solution Id: S-073340. In SOLIDWORKS® Motion, is it possible to use an ‘Action & reaction’ force expression to approximate the behavior of a nonlinear damper with a non-integer exponent? It is possible to use an ‘Action & reaction’ force expression to approximate the behavior of a nonlinear damper with a non-integer exponent. For an example, download and extract the ZIP file attached to Solution Id: S-073284. In SOLIDWORKS® Flow Simulation, how do I calculate the efficiency of a turbine? You can use SOLIDWORKS® Flow Simulation to calculate the efficiency of a turbine or a pump by using an equation goal. Follow the methodology explained in Solution Id: S-073260.